The Australian GT Championship got underway at Wakefield Park last weekend (March 4-5) and, amid some bizarre circumstances, Allan Simonsen won two of the three races, in Ted Huglin’s former-ACEMCO Ferrari 360. The first bizarre circumstance was that the Dane wasn’t even supposed to be racing. “I wasn't doing anything that weekend and Ted asked me to come along and assess the changes to the car over the summer break, in the first practice session," said Simonsen. The plan had been to sort out a niggly gear selection issue (which had plagued the Ferrari in 2005) during the off-season, but Huglin was horrified to find that it was still there in practice for the first race. "With the gearbox selector gremlin I feel Allan will be more effective in the car this weekend than me, and that can only help us as the season moves forward," said the car owner. There was another handicap for the 360, for the first race – the organisers had decided to give it 150 kg of ballast and 1000 revs. less than in 2005. But there was more to come…. Simonsen qualified fifth for race 1 – but only three-tenths slower than pole man Greg Crick in his Viper. The race turned out to be almost routine: the Dane picked off the Vipers and Porsches one by one, took the lead on lap 13, and won – simple as that. The organisers stepped in – and granted the Ferrari an additional 77 kg of ballast! Ted Huglin argued that 227 kg of ballast could damage the car, and a compromise was reached: an extra 37 kg. There was still more to come though: as Simonsen sat on the dummy grid, the team was told to raise the ride height of the car by 20 mm. The team had no choice but to comply. 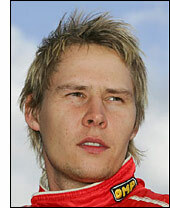 Simonsen struggled to fourth place in the race, with a car that was behaving like a “tail-happy go kart”, but an infringement by another (higher placed) car saw the 360 elevated to third. Race 3 saw some common sense prevail, and the ride-height was re-set and the 37 kg removed. From third, Allan Simonsen took the lead, from the Crick Viper, on lap 3 – and took his second win of the meeting. Apparently Crick referred to himself as a "Scrooge McDuck", which must be an Australian expression for a "tight-****": he chose to save money and not fit fresh rubber. "I'm starting to like the idea of these weekend's off!" grinned the popular Dane. He’s obviously the championship leader at this stage of the season. The next event is at Bathurst in mid-April.